This was radio. When TV was a nascent entity, Edward Murrow was its king. There was no better new organization than CBS, whose reporters—bright and fearless—were known as “Murrow’s Boys.” They were good. Very good. 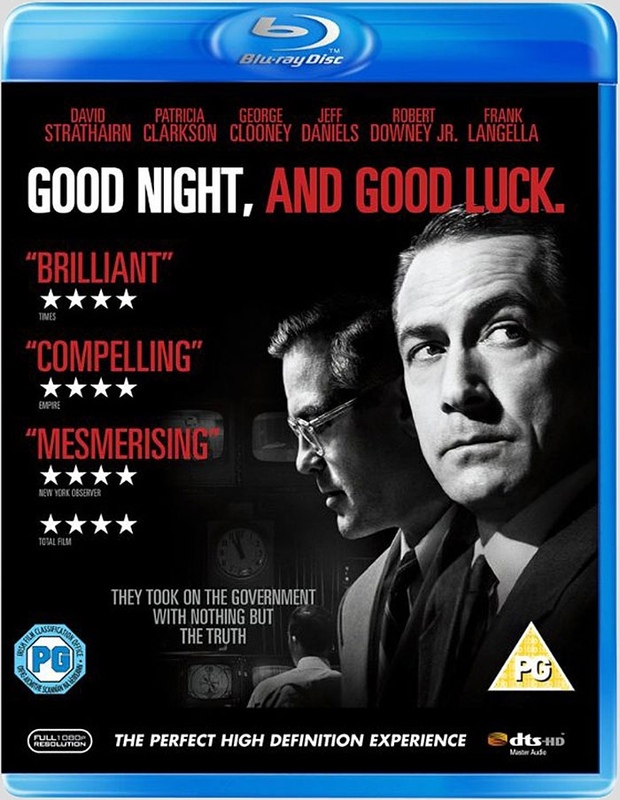 This film, “Good Night, and Good Luck” is nothing short of spectacular. David Strathairn plays the chain-smoking Murrow as a sullen, serious newsman—no laughter, no frivolity, just the occasional Scotch. (Strathairn is a non-smoker—his cigarettes were filled with non-addictive herbs, etc). George Clooney was tremendous as Murrow’s apologist and producer, often taking the heat for the man he knew was so talented, and—so often—dead right. The chemistry between the two had to be perfect for the film to work, and they nailed it. . The truly best performance though—and forgive me for saying this—was the entire cast. They worked as one unit, a team working to do good work and get the news out. Jeff Daniels, Robert Downey, Jr, Frank Langella—the list goes on—and everybody shines. This film is impeccably directed by George Clooney. The first time I watched it, I couldn’t believe it was his work—he just didn’t seem the director type to me—but he hit a tape-measure home run with this film. One interesting touch, is that about every ten minutes or so, the film cut to the singer, Dianne Reeves. Back in those days, there was live music on the radio. Her soulful voice is clear and strong, and she’s backed by a stand-up bass and drums. It’s odd, but it works. For example, she’ll be in the background of a bar they visit, or she’s singing a song on the radio..
“Good Night, and Good Luck” is ninety minutes long, but it feels so much shorter. TV newsrooms can be exciting places today. Back in the early days—pre-video, pre-computers—they were madhouses. “Good Night, and Good Luck” is bookended by Edward R. Murrow being given an award. Rather than give a graceful speech, he launches into an eloquent criticism of his medium, and how it can be used for good. If once in a while, they took the hour of The Ed Sullivan Show, and broadcast a documentary about the state of education in America, would that be so bad? If he could see some of the crap on TV today, he’d see how sadly right he was. This entry was posted in Academy Award Nominees, Based on a True Story, Films, Films Watched in 2014. Bookmark the permalink. Just a fantastic film. I don’t think it gets enough credit.